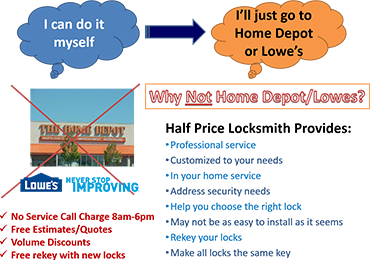 Locked out of car or house? Forgot the combination of safe lock? Broken or damaged car and house-door keys? 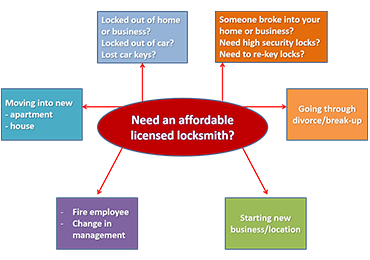 We offer an emergency and you demand locksmith services at the time of needy. Our team attains you shortly and unlocks your locking system in as little as 15minutes. You can avail our 24/7 emergency Locked out services even in middle of night, weekends and vacation times without paying extra dollar for it. Car Locked out: locked out of car when the key is locked inside, give us a call for rapid action. Car key replacement: lost or damaged car keys are remade or replaced perfectly within a while. Other problems: Key stuck in car ignition, cutting a new car key or anything else, Half Price Locksmith can help you whenever you need. House Locked out: Locked outside of the room, forgetting the key inside. Give us a call for unlocking your door. Fixing broken or damaged locks: repaired and replaced in almost no time. Commercial Locked out: Forgot the combination of safe. Call Half Price Locksmith for changing the combination and open the safe. Update your security: Install new and advanced padlock to secure your business. Consult Half Price Locksmith for fast and finest locksmith service.